ScarabWeb.com - How to effectively manage your server? If you decide to purchase a dedicated server you need to manage it really effectively not to miss out on some of the most important benefits. In some cases, poor management results in security loopholes that cost businesses and individuals huge amounts of time and money. By keeping a few basic tips in mind, you can effectively manage your dedicated server and make the most of it at all times. Scarabweb Company offers 3 types of OS to install on dedicated server. No matter whether you buy Linux OS, Windows OS or Virtualization OS you need to be familiar with the most effective tools for managing your dedicated server, you will be able to avoid the most common pitfalls. First of all you need monitor your server. Effective monitoring can help you avoid a variety of serious issues. For Windows OS we have Task Manager or Event Viewer tool, for Linux OS – Top command. It can be used to verify and monitor the performance of many server resources, including things like CPU and memory usage, cache size, buffer size, commands and much more. It’s also a good tools for monitoring and managing users because it lets you see the processes and applications that they’re using and gives you the ability to disconnect users when needed. This is a far more practical and effective way to monitor your server. 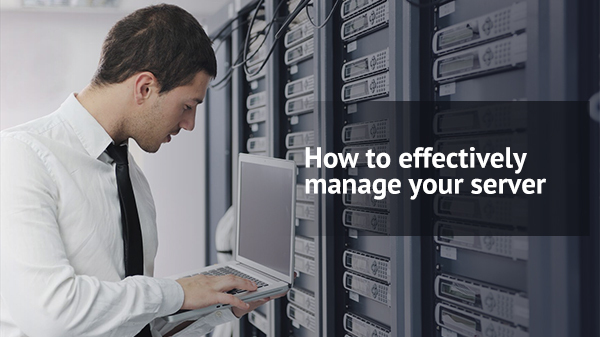 Second tip is you should manage processes and services while monitoring your server. Different tools can be used to stay on top of various processes to ensure of easier detecting any problems and could be addressed promptly. Thirdly, to prevent unauthorized access to your server you need to implement a change management processes and manage remotely. There are many remote connection tools as Remote Desktop Connection tool, SSH connection or other which could warn your dedicated server to be vulnerable to attack. Try a few different options to pinpoint the one that’s right for you. By having the ability to access your server remotely, you will be better able to manage and monitor it. To protect your dedicated server you also need to set up a firewall and configure it properly. It will help to prevent unknown users from accessing the server so that the server can only be accessed by trusted IP addresses. You can also choose an external firewall from various vendors like Cisco, Juniper, Watchguard, etc. Continually stay on top of the latest technologies to ensure that you have the best tools at your disposal.